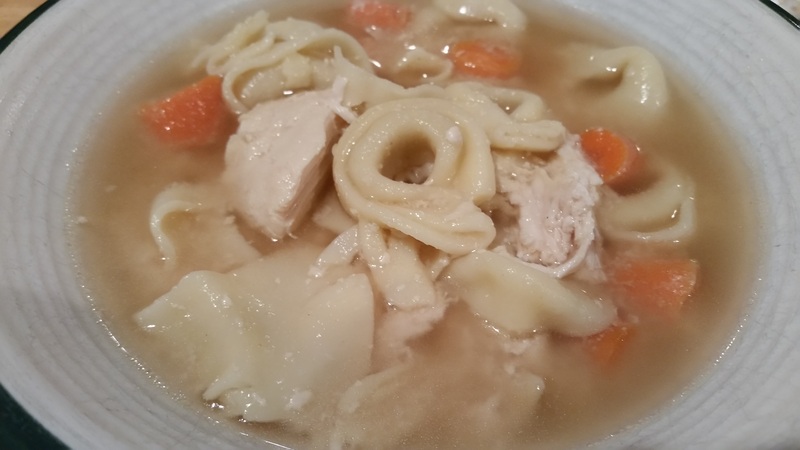 Chicken Tortellini Soup – What's for Dinner Moms? Sometimes you just need some chicken soup. My son loves homemade chicken soup year round but now that we are coming into fall he loves it in his lunch all the time. It is so simple to make a large pot of it in the slow cooker and then freeze it in individual portions for lunches. I added a twist to this for dinner by adding cheese tortellini at the end of the cooking time. Both kids thought this would be delicious with a spicy sausage tortellini to add a bit of a kick to the dish. This is a nice, hearty, comforting dish. It reminds me a bit of an old-fashioned homemade chicken soup. You can add and subtract vegetables as you like and add spices to your liking too. Play with it and see what works for your family! tip: Tortellini does not sit well in the soup or reheat well. If you plan on serving it over several meals add tortellini just before reheating. Do not freeze the tortellini in the soup. In a large slow cooker mix chicken, chicken stock, onion, celery, carrots, and garlic powder. Cook on low for 6-7 hours. Thirty minutes before serving mix in tortellini. Add salt and pepper to taste. Cover and cook for 20-30 minutes until tortellini are heated through. DO NOT OVER COOK TORTELLINI OR IT WILL TURN TO MUSH. I’ve had the “turned to mush” problem with regular noodles as well. There are some wonderful tiny German noodles we can get at a specialty store that do much better, even in the freezer, but usually, like you, we just freeze the chicken and broth without noodles and add fresh each time we serve. The great thing is these tiny little noodles (and tortellini too, I would think) cook quickly! Yes! If I am going to freeze soup with something I usually use wild rice because it is a bit heartier and doesn’t break down as quickly. Thanks! Oh how I love soupThis one sounds perfect!!!! Thank you so very much! You too! Thank you! I hope you like it if you do! YUM! I love tortellini in soups.